Installing paint protection film is a smart and efficient way for drivers in the Valley to invest in the resale value of their vehicle while enjoying a beautifully maintained paint job. It’s no wonder why Arizona drivers equip their cars with protection film. However, unless you keep up with properly cleaning and maintaining your vehicle’s protective film, you won’t see the long-lasting results you want. When it comes to cleaning your paint protection film, there are a handful of dos and don’ts to remember. Immediately remove bird droppings, bug splatters, and tree sap. Use a premium sealant if your protection film does not have a ceramic coating. Avoid the edges of the film and stay at least 36 inches away from the film’s surface) when using a pressure washer. Wash your vehicle for 7 days after application. Wipe your film while it’s dry. Apply aggressive chemicals or aggressive force. Use a power buffer, polishing equipment, or clay products. You’ll see the best results from your paint protection film if you commit to maintaining its condition, keeping in mind the tips below. Dust and wax your film on a regular basis with non-abrasive waxes and polishes like Carnuma or Teflon-based to prevent dirt buildup and maintain the finish. Regularly wash your car using a liquid-based car soap, extremely soft sponge, and microfiber or chamois drying towels. Use a small toothpick to gently remove wax buildup on the film’s edges. By keeping up with these simple tasks, you’ll keep your paint job looking good for years to come. Contact Smartfilm AZ and Schedule Your Installation Today! Protect your car’s paint job against our harsh desert climate! 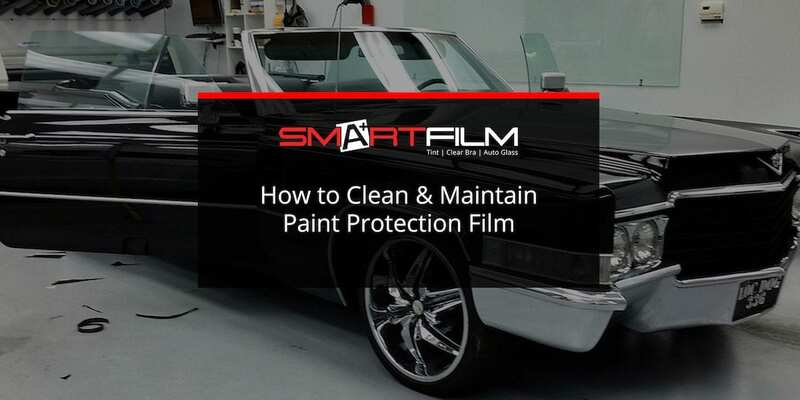 Paint protection film is an easy, no-hassle way to preserve your car. Give us a call to set up your installation and learn more about the services we offer our Valley customers!